Wind storm Brian is closing in on western Ireland and the U.K. Officials expect the storm to be disruptive throughout the area over the weekend. Currently, the storm’s central pressure is around 964 mb. Our Earth Networks meteorologists estimate that the pressure will weaken slightly to 970 mb by 6 a.m on Saturday. After making landfall on Saturday, the pressure will continue to rise to 979 mb by mid-day as it moves over the Irish Sea. The arrival of Wind storm Brian could coincide with high tide. This will mean higher waves and more potential for storm surge-related damage. While worrying about the water, residents cannot forget about the wind. An orange alert for high winds is active in southern and western coastal counties from Mayo to Wexford. A status yellow wind warning is in place for the rest of the country. The country will start feeling the effects of this storm late Friday evening. Ahead of the storm, wind gusts of 50-60 mph are likely. However, the main bursts of high winds is expected on Saturday as the storm passes eastward across Ireland. Wind gusts of 50-55 mph are likely across all of central Ireland (Galway to Dublin). Wind gusts of 55 – 50 mph are likely across all of southern Ireland. According to Earth Networks meteorologists, James Aman, even higher wind gusts are possible in the mountains and right along the Atlantic coast of Ireland. 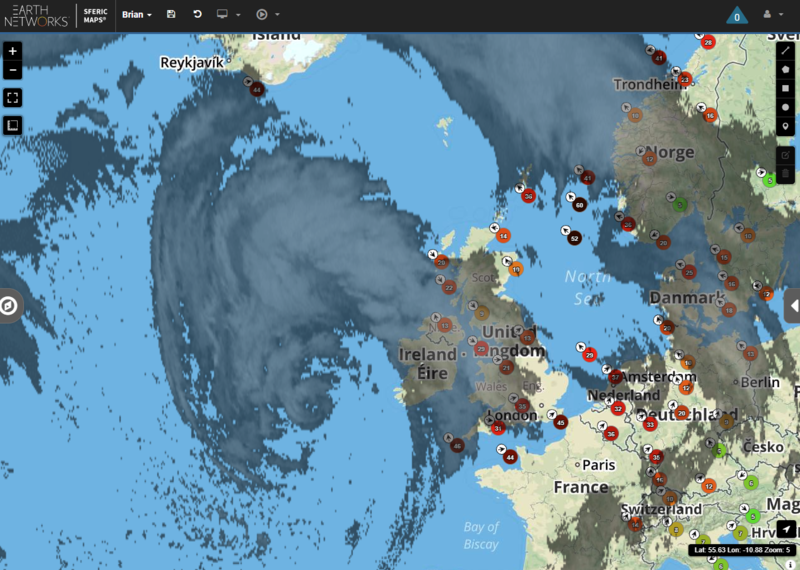 Our global weather station network shows the current gusts throughout Ireland and the U.K. in the image above. Gusts above 30 mph are already happening along the western coast of Ireland. The best way to ensure your home and business are safe from Brian or any other wind storm is to have a plan and monitor real-time, hyperlocal weather conditions. 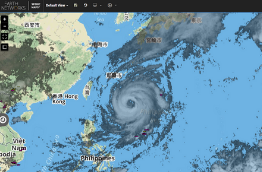 Businesses and governments using weather visualization tools will be able to prepare for this storm very well. Make sure your plan details who in your family or organization is responsible for what and assemble emergency supplies. Next, you should secure your perimeter. Make sure any garden furniture or outdoor items are tied down and secure. You do not want them flying around during a wind storm. You should also regularly inspect your roof. A roof can take a lot of damage during a wind storm. The next step you can take to prepare is to protect windows and glass. If you live or work on the coast, invest in pre-fitted windstorm shutters. In a last minute situation, plywood will also do well. Wind storm Brian just comes a week after Tropical Storm Ophelia battered Ireland. During this storm, 70 mph gusts were recorded throughout Ireland. The strongest gusts occurred on higher elevations on the coast. Ophelia was so strong that it produced the largest wave ever recorded in Ireland. The Irish Weather Buoy Network confirmed it recorded one individual wave off Waterford which reached a height of 58.4 feet. This is almost the height of a six-story building. Three people died as a result of Ophelia and local residents are on high alert as Brian approaches.